One Year Ago…Kickstarter Campaign Launched! I remember being so nervous the night before it launched thinking that the campaign might be a huge flop! This DVD was a dream of mine for years after knowing how eager schools were becoming to educate students about food allergies. I wanted this resource to be a reality so badly, but I didn’t know if others would share this passion. If the Kickstarter campaign had failed, I would have likely given up on this dream. That first morning when the campaign went “live”, I had no time to be nervous. The generous support started rolling in. I couldn’t believe it! Within an hour we were over $3,000 and I was dancing around my kitchen! We reached the initial goal of $20,000 well before the deadline, and added stretch goals to help us reach $30,000. That’s bananas! That was a wild month filled with so much work – but it was an experience I’ll never forget and loved being able to bring a whole community together to support a common goal. One year later, the DVD is out, circulating in schools, getting into the hands of distributors, and getting great reviews! I’m so grateful to the food allergy community for coming together to help me achieve this dream! THANK YOU to all of my backers! I’m happy to give back in return by by donating 20% of DVD proceeds to food allergy non-profits when purchased from http://www.foodallergyvideo.com/purchase.html. Allergy Awareness Poster – Featuring YOUR CHILD! There was ONE really cool reward that was added so late in my Kickstarter campaign, it practically went unnoticed…. 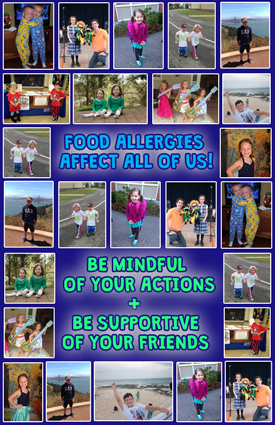 A food allergy awareness poster featuring your child’s photo! Talk about a unique gift! 20 SPOTS LEFT, $25 to reserve yours + receive two 11×17″ copies. All $ directly supports DVD project. Image is a mock-up. This will be created by a professional graphic designer. I’m mostly known for my songs about food allergies, but am also passionate about educating people about celiac disease and intolerances. Have you heard my song “Gluten-Free Blues“? I think there is a lot of confusion out there about the differences, but I also think it’s important to highlight the similarities. For children, knowing the exact difference between food allergies and intolerances is not essential. Is it fair to expect that a 4-year old knows that anaphylaxis initiates in the immune system, and celiac disease occurs in the digestive system? Of course not. Keeping things simple for kids is the key when educating about such complicated things. This type of messaging does not scare kids, yet empowers them to help people with allergies or intolerances. This is the approach I am taking in my upcoming video “Kyle Dine & Friends” which will help educate children about food allergies, celiac disease, and intolerances. The Kickstarter campaign to fund it ends on Dec. 21st. Pledge and get a limited edition reward today! What a fun opportunity to be interviewed on Station 14 in Kingston, ON! Check it out! Unlike other projects, this one has a multiplier effect. It’s unique in that there is much more value in the number of backers, than the number of dollars. Add your school to the equation and be the reason why hundreds more will be educated about food allergies! We Hit our Kickstarter Goal in 6 Days! Now What?? What a really fortunate position to be in! The thing with Kickstarter is that you never really know how successful your campaign could be. It could be a flop, it could be a smash. I was overjoyed by the outpouring of support early on in my campaign from the allergy community, friends and family. It definitely takes a lot of the pressure off when you hit your goal so early. 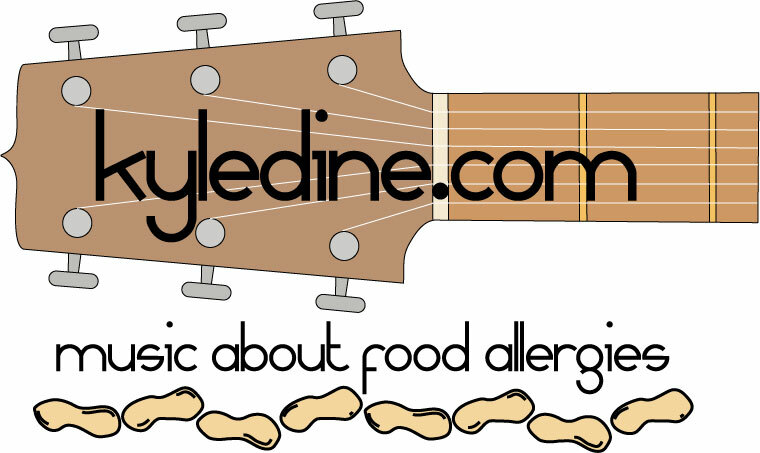 The Kickstarter campaign for “Kyle Dine & Friends” allergy DVD wraps up on Dec. 21st, 2014. During this time, I will keep reaching out to families, schools, media and more to spread the word. When I set my initial goal of $20,000, I purposely set the “bare minimum” amount I would need to create this video. Kickstarter uses an “all or nothing” approach. This means that if I didn’t hit my goal (even ending with $19k), I wouldn’t receive anything. I set a goal I knew I could achieve because I want this DVD to be a reality!! Now that math gets simple. The more backers that pledge, the better the DVD will be. I will be able to add more graphics through the editing process, animation and better effects. I’m also really passionate about adding sub-titles so allergy education can be included for both French and Spanish speaking students. I will also utilize my video studio time to create a series of FREE educational clips for YouTube. Plus, with every backer, we’re getting the DVD into one more school and potentially reaching hundreds of students! For that fact alone, the number of backers for this project is so much more important than the number of dollars. Help us reach more schools! Join in the fun and pledge today! Allergy DVD Kickstarter – What a Weekend! I’m sitting here having my Monday morning coffee finally catching my breath after the outpouring of support for our Kickstarter campaign this weekend. 72% funded in 72 hours…seriously? I am beyond grateful to every one of you. If I haven’t sent you a personal thank you note, it’s coming. I hope you realize that YOU will be the reason why kids will be educated about food allergies in schools for years to come. I want to recognize everyone who is a part of this unique and special campaign. I have created a “Wall of Appreciation” where every single backer is listed (check it out! http://www.foodallergyvideo.com/wall-of-appreciation.html). Every brick counts. We are building something together that is bigger than me, bigger than you. It’s a community coming together to create change, and I hope you’ll join us to be a part of this movement!